Weve all been there. Waiting at the baggage carousel for our luggage when we spot it...only it turns out that was someone elses bag. Or we inadvertently pick up the wrong bag and make for the taxi. Well that all ends today with this unique and intelligent Israeli invention. The proximity luggage tag. This is a small palm sized device that acts like a transponder, in that it beeps when the corresponding luggage tag, connected to your suitcase, is within 12-15 metres. The expected cost $15-20 each. We are pleased to announce that we have just been selected to receive the USLBA 2008 Best Of St Louis Award for the Locksmith & Keys Category. WASHINGTON D.C., July 25, 2008 -- Master Key Systems America, LLC has been selected for the 2008 Best of St. Louis Award in the Locksmiths & Keys category by the U.S. Local Business Association (USLBA). 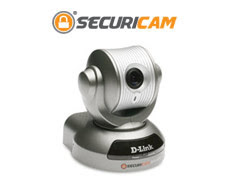 D-Link just introduce this latest addition to their line of cameras. The D-Link Pan/Tilt/Zoom PoE Internet Camera (DCS-5610) is a full-featured surveillance camera designed to monitor the home, office, and small business. IP surveillance systems are quickly gaining ground over conventional CCTV security cameras due to superior performance, low costs, and convenient management. Features such as Power over Ethernet (PoE) support, 2.6x optical zoom, SIP 2-way audio, and 3G mobile phone support make this network camera a premier surveillance solution. With the ability to Pan/Tilt/Zoom, the DCS-5610 is an ideal whole room surveillance camera. Mount the camera on the ceiling or wall and receive whole room surveillance. Support for 802.3af Power over Ethernet (PoE) enables the DCS-5610 to receive both power and data over an RJ-45 Ethernet cable from a PoE enabled switch, negating the need for a nearby power source. The DCS-5610 supports 2-Way Audio with its built-in microphone and audio-out port*. Attach a powered speaker to the audio-out port and remotely communicate with anyone within close proximity to the camera. Additionally, you can utilize the compatible IP Camera Outdoor Enclosure (DCS-70) to monitor and survey in harsh outdoor environments. The DCS-5610 supports both MPEG-4 and Motion JPEG (MJPEG) to provide both high quality and bandwidth efficient compression formats. Motion JPEG delivers greater file integrity, making it ideal for detailed monitoring situations. MPEG-4 video utilizes compressed files, useful for extended recording periods or for use in low bandwidth networks. With support for 2.6x optical zoom and 4x digital zoom, you can view the camera’s video feed in close-up detail. Plus, the DCS-5610 supports a resolution of 640x480 at 30fps, allowing for high-quality recordings. Support for 3GPP Mobile Surveillance allows you to view a live video feed from your compatible Internet-ready mobile phone or PDA with a 3GPP player installed. This extends your monitoring capability without requiring the use of a computer, allowing you to check your camera’s video feed while on-the-go. Manage the DCS-5610 using a Web-based interface or with the included D-ViewCam™ 2.0 management software. D-ViewCam 2.0 management software can manage up to 32 network cameras, send e-mail alert notifications, set recording schedules, and trigger motion detection to record directly to your hard drive. D-ViewCam 2.0 also allows you to upload a floor plan of your home and create a realistic layout of where your cameras are located, further simplifying the management process. The City of St Louis, Missouri adopted the 2003 International Building Code as it's standard charter for residential and commercial developments. The most recent updates to the code appear to be 2003-2006. Section 406.1.4 is updated to read, "Door openings between a private garage and a dwelling unit, shall be equipped with either solid wood doors or honeycomb core steel doors not less than 1 3/8" thick, or doors in compliance with section 715.4.3. Openings from a private garage to a room used for sleeping purposes, shall not be permitted. Doors shall be self-closing and self-latching." Section 1008.1.9 is updated to read, "Each door in a means of egress from a Group A or E occupancy having an occupant load of 50 or more and any Group H occupancy shall not be provided with a latch or lock unless it is panic hardware or fire exit hardware." There are certain exemptions in rare circumstances, but the above is the gist of it. I have been looking into the particular rules for the City of St Louis, Missouri Emergency Egress laws, in order to be able to accurately and efficiently make the correct recommendations to potential customers. St Louis City Revised Code Chapter 25.06: FIRE PREVENTION CODE, includes the following bylaws in section F4702.1 MEANS OF EGRESS. F-4702.1 Number of exits: In nonresidential buildings, every occupied story more than six stories above grade shall be provided with not less than two independent exits. In residential buildings, every story exceeding two stories above grade shall be provided with not less than two independent exits. In stories where more than one exit is required, all occupants shall have access to at least two exits. Every occupied story which is both completely below grade and greater than 2,000 square feet (186 m2) shall be provided with not less than two independent exits. 1. Where the building is equipped throughout with an approved automatic sprinkler system and an approved automatic fire detection system with smoke detectors located in all corridors, lobbies and common areas. 2. Where the building is equipped throughout with an approved automatic fire detection system, and the exit is an approved smokeproof enclosure or pressurized stairway. 3. Where an existing fire escape complying with the building code listed in Chapter 44 is provided in addition to the single exit. 4. Where permitted by the building code listed in Chapter 44. Next, we will look at Chapter 44 to determine correct definitions and code compliance requirements. Update: Chapter 44 appears to be elusive. The Guard Dog is a portable door guard equipped with a siren alarm. When the Guard Dog is activated with the motion sensitivity switch, a 120+ decibel siren sounds if the door or door handle is moved. The Guard Dog is ideal for keeping you and your loved ones safe from harm. Its folding, shock-corded design snaps together in seconds and works on most door handle styles. It comes with leg extenders, allowing the guard dog to fit any sized door. 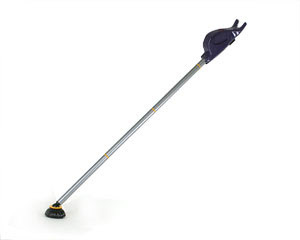 It is equipped with a steel leg preventing the door from opening, and has a non-skid foot that grips any floor surface. The Guard Dog folds to a compact 12" x 5" size making it portable so you can take it with you when you travel. The Guard Dog is ideal for anyone and can be used virtually anywhere. Works best if activated while you are at home. I really enjoy learning new ideas and skills that better my skill level and help me to provide broader ranges of products and services to my growing clients. One such company, I only learned about in recent days, is Markar Architectural products. Markar is a manufacturer of architectural grade adjustable continuous hinges and edge guards and has been a leader for innovative products in the hardware industry since 1969. Markar was the first manufacturer to produce a continuous pin and barrel hinge line and a patented adjustable continuous edge guard. By listening to its customers' feedback, Markar developed over seventy standard continuous hinge models in order to provide products for a wide variety of applications. 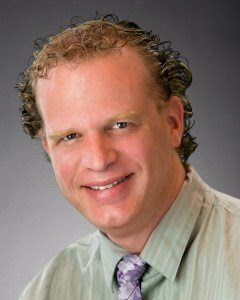 Markar is a company committed to growth and over the years has expanded its operation to include a door component line. Markar's lite kits and louvers are a cut above the rest for maximum strength and durability. As a subsidiary of the Adams Rite Manufacturing Co., Markar will continue to lead the way for innovative and advanced design concepts for the door and hardware industry. Many people are unaware of the reasons their doors often stop working or have problems with closing and securing. There can be multiple reasons for doors not functioning properly, but surprisingly, one of those reasons is very often overlooked. An experienced tradesperson will usually be able to tell immediately where a problem may be. It is often critical to also look at the hinges as one of the fundamental factors in repairing or maintaining quality security and functionality. Pictured above are some diagrams depicting typical stress points on a typical door fitting. Installation of continuous hinges, like the ones manufactured by Markar, can help to prevent these problems. I recently met the local Fire Marshall and enjoyed a revealing conversation with him about life safety codes and the fire code. Part of our discussion involved me showing him the following product. This intelligent device simply slips over your existing entrance set and provides for a glow in the dark handle grip. Perfect for arthritis sufferers. Opening doors just got easier. 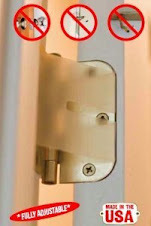 Stop struggling with slippery door knobs! 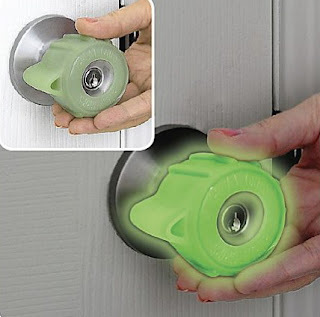 Great Grips go over round door knobs, creating a secure, slip-free grip. Grips glow for up to 8 hours so you’ll never fumble for a knob in the dark again! No tool installation — simply moisten with water and stretch to fit. Set of 2. Use of these sensational products is considered one of the least expensive methods for complying with ADA and AHJ panic exit requirements without the need to replace or install expensive hardware. Most jurisdictions have adopted the 2003 International Building Code as the basis for construction. Many inspectors will not issue occupancy permits unless door hardware meets code. Now you can comply with the code without the need for expensive hardware. The Fire Marshall was unfamiliar with the product, but appeared very enthusiastic and supportive of this incredibly inexpensive and thoughtful initiative to attempt to make existing hardware applications, safer. If you’ve ever locked yourself out of your car or home, you know what a hassle it can be. Your first thought is to get someone to help you out of your situation. 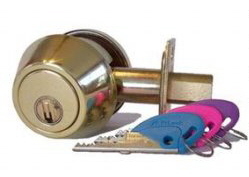 If a family member or friend can’t deliver a spare set of keys, your next call might be to a local locksmith. 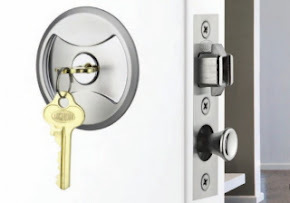 But before you make that call, consider this: According to the Federal Trade Commission (FTC), the nation’s consumer protection agency, some locksmiths advertising in your local telephone book may not be local at all. They may not have professional training. What’s more, some of them may use intimidating tactics and overcharge you. Consider this scenario: A company far away from your town chooses a name for its business that is very similar to the name used by a local locksmith. The company advertises in the phone book or on the Web using a local telephone number and local address. When you call the number, you’re actually connected to a call center in another city. What’s more, there’s no locksmith shop at the address listed. You may be quoted a price on the phone, but when the locksmith arrives, often in an unmarked vehicle, he may want significantly more money. The locksmith also may accept only cash. Some who claim to be “local locksmith” companies have multiple listings (sometimes 30 or more separate listings in a single phone book) with different names. But the calls to each of these numbers go back to the same central number in a distant city where operators dispatch untrained individuals to do the job. Catering to security minded people is what this site is aimed at. A passive infrared system that will detect movement in any selected 40 ft. area, 105 db Alarm. 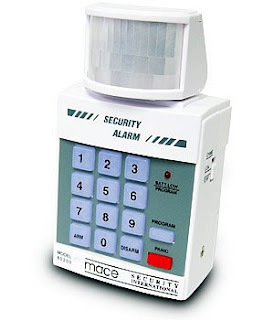 Complete with programmable security code, adjustable sensor head, low battery indicator. Mounting screws and hanging hardware included. 9 volt battery (not included).